Overall length: 20 feet, 0.08 x 0.14 inch (2 x 3.5 mm) x 5 feet, 3/ 32 x 3/ 16 inch (2.5 x 5 mm) x 5 feet, 1/ 8 x 3/ 16 inch (3 x 5 mm) x 5 feet, and 1/ 8 x 1/ 4 inch (3 x 6 mm) x 5 feet, satisfy most of your needs. 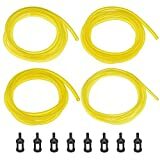 Replacement set (includes fuel hoses and fuel filters), heavy-duty and durable to use, will keep your engine running smoothly; Can be applied in chainsaws, string trimmers and other engine machines. 1. The items are non original parts, please check the size and choose the size for compatibility before ordering it. 2. These items are not suitable for children under 3 years old.